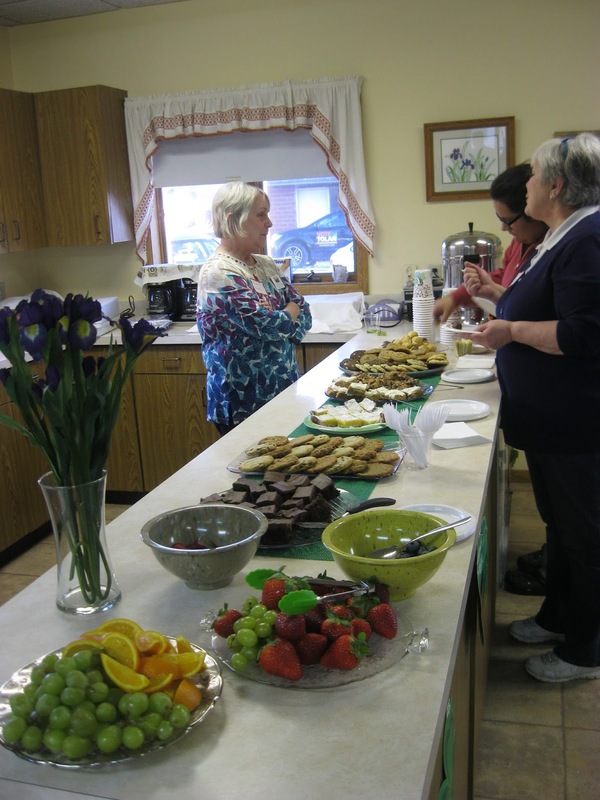 38 participate in Grantsburg Village Board Forum! The Grantburg Friends of the Library laid a wonderful spread for the 38 folks that participated in the 2017 LWV USCV Candidate Forum for 3 contested Village of Grantsburg Board of Trustees seats and for the contested President of the Board position. A cordial atmosphere was created at once as the room filled. Library Director Kristina Kelly-Johnson welcomed the crowd to the Bruce E Erickson Learning Center of the Grantsburg Public Library. Marilyn Chesnik welcomed all on behalf of the LWV Upper Saint Croix Valley and talked about the two and a half years that went into getting our chapter off the ground and to this event. Judge Ken Kutz, the evening's moderator, followed to explain the rules that would govern the forum. 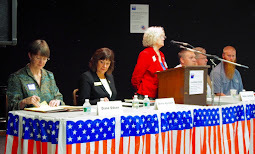 Each candidate stood in turn and spoke about themselves, their vision for the Village and what they hope to accomplish in their tenure on the board. Questions followed both pre-submitted and directly from the audience. Each candidate spoke to the questions in turn. Here are some photos of the evening. Click on the photos to get a larger view. Some 55 individuals attended the LWVUSCV sponsored candidate meet and greet on Tuesday, March 14 at the Luck Senior Center where we enjoyed dessert and got a chance to mingle with the candidates before each had an opportunity to present 15 minutes on their candidacy. Jeff Anderson, Branch 2 Polk County Circuit Court Judge, unopposed, got the honor of speaking first. He gave us a rundown of the issues confronting the circuit court in Polk County and the challengers that lay ahead. We heard from Burnett County candidates David Grindell and Melissa R. Mogen and Polk County candidates Malia Theresa Malone and Daniel J Tolan. We learned about the backgrounds of each of the candidates, what issues are nearest their hearts and the challenges that each sees in the position they seek. Here are a few photos of the evening's event. Thank you to Mary Bjorgaard for a well planned and executed event. And all those who helped pull it off!! Another successful event under our belts!! League of Women Voters - Upper St. Croix Valley Making Democracy Work! Prepare write-ups of committee descriptions for Annual Meeting. Create email list, google drive? Make sure members can view information.